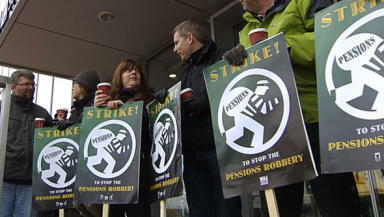 Local news programmes forced off-air on second day of walk-out in pensions row. BBC TV bulletins in Scotland were dropped on Saturday as journalists remained out on strike. The corporation confirmed no local television bulletins were being broadcast on the second day of a 48-hour walkout by members of the National Union of Journalists. The strike action is part of a row over changes to the BBC's pension scheme and began on Friday morning. Picket lines remained outside the BBC's Scottish base at Pacific Quay in Glasgow on Saturday. NUJ president Pete Murray, a BBC Scotland producer, said the decision to drop Scotland's bulletins "gave us good encouragement from the outset today". He added: "The feeling in Scotland has been tremendous. The strike is still absolutely rock-solid, as it was yesterday." A further 48-hour strike is planned for November 15 and 16. Mr Murray added: "Our case at the moment has to do with postponing implementing the pension deal until the BBC has the figures for the deficit. "They don't know the definite figures yet and they're waiting for all the actuarial assessments." A BBC spokesman said: "Two short BBC Scotland television news bulletins did not go ahead today due to industrial action by the NUJ and we apologise to viewers for that loss of service. "Our radio news output in Scotland has gone ahead as scheduled."